Is Storage Hunters UK Real or Fake? By this point, even the most diehard storage auction reality show fans are starting to face the facts: None of these shows are 100% authentic. Reality TV doesn’t so much show real life as a glossy, action-packed melodramatic version of real life. After all, it takes a bit of “TV magic” to turn our regular, boring everyday lives into the kind of gripping drama that gets people to tune in week after week. So there’s always some element of dramatization going on in these shows, whether it’s the participants hamming it up a little for the camera to create memorable characters or tons of less-than-thrilling material landing on the cutting room floor. Of course, Dave Hester’s lawsuit against Storage Wars blew the whole topic wide open. His allegation was that the show was almost entirely faked, frequently showing “salted” units that had interesting items planted in them by the production company. And, as storage shows go, Storage Wars has always been the most believable. 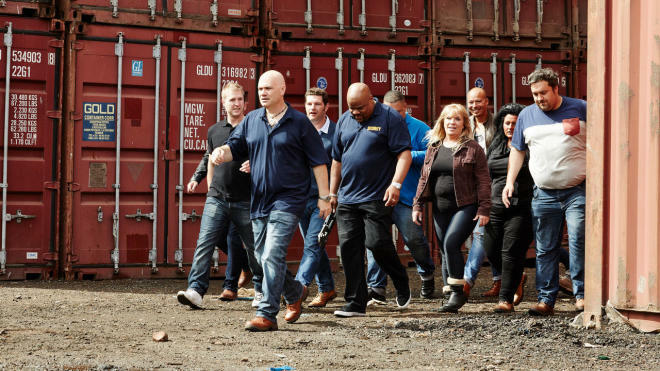 Which brings us back to Storage Hunters: UK, the newest kid on the block. 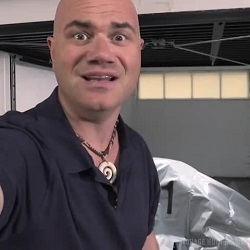 Storage Hunters: UK follows American auctioneer Sean Kelly (star of the American Storage Hunters on TruTV) as he travels through the United Kingdom to host storage auctions for an array of colorful characters. The original Storage Hunters was a surprising smash hit over the pond, with episodes being aired on the Dave network (a British channel that runs local programs like Red Dwarf alongside other imports like Man vs Food), so a homegrown spin-off seems like the natural next step for the series. Storage Hunters has always been one of the most outlandish and overly dramatic members of the storage auction reality TV family. While other shows threaten your willing suspension of disbelief by showing unbelievably rare or valuable items popping up in a lot of units, Storage Hunters likes to push your credulity a little bit further with truly bizarre discoveries and a generous sprinkling of Jerry Springer-like fights. Storage Hunters: UK is cut from the same cloth. After all, why mess with the formula that made the show so successful in the first place? The program premiered with an impressive 1.1 million viewers, making it pretty clear that UK audiences were eager for more storage hunters behaving badly. But how much of it is real? It’s safe to say that, for the most part, the characters on the show are pretty much real people. This isn’t like an Auction Hunters situation where small-time actors are looking to make it big on reality TV. All of the bidders on the show are genuine resellers, from antiques dealers to online storefront runners. Only one cast member, Daniel Hill, has an IMDB credit for anything other than himself – and that, curiously, is as an uncredited body double for Sacha Baron Cohen in Les Miserables. There’s probably quite a story behind that, but otherwise “Dapper Dan” seems pretty committed to his day job as a furniture dealer. So the people they’ve hired are real buyers, as near as we can tell, but their on-camera hijinks are probably hyped up for the camera. Because, let’s face it: If the frequent (sometimes several-times-in-one-episode) arguments and out-and-out fist-fights on the show weren’t scripted, you can bet these guys would find themselves thrown out of the auction sooner or later for being a huge nuisance. But what really stretches the limits of believability with Storage Hunters: UK are the units themselves. When you’re watching the show, you can’t help but notice that the units seem to be rather conveniently staged. Nearly all of them are perfectly themed. Here’s a unit full of nothing but circus equipment. Here’s one with a ton of bicycles. Here’s one totally full of exercise gear. You never seem to find a unit full of mixed, normal items – a box of clothes here, an exercise bike there, an old couch here. You know, like a real person might actually keep in their storage unit. Who owned these units before they got on the show? But then you reach heights of absolute absurdity, like the pilot episode where they opened up a unit to discover a raw heart in a basket. Considering how hot it gets in a storage unit, and how long a unit has to be in default before it can go up for auction, the odds of you finding a perfectly fresh-looking, not-putrid heart just lying in a basket are basically nil. Of course, this is from the same production company that brought you exotic finds like “Naked man in a cage” and “Conveniently rigged controlled explosion” on the American show, so nobody should be surprised. As the series progresses, we’re likely to see things get even more outlandish because the laws governing reality TV and storage auctions are different in the UK than they are in the US. For example, until the storage auction craze really hit the world, auctions of that type weren’t really popular in Britain. While US facilities usually sell a person’s belongings in their entirety, it’s completely normal in the UK to divide up a person’s abandoned items and sell them piece-by-piece. So with that in mind, it should come as no surprise that these units are probably staged well in advance for dramatic effect. Here’s the bottom line: Nobody’s really watching Storage Hunters: UK for an informative look at the auction business. They’re tuning in because it’s the very best of trash TV, with enough mystery, weirdness and drama to keep you engaged. If that’s your bag, just sit back and enjoy – but don’t expect to get by with starting a brawl at the next auction you attend. What’s your opinion on Storage Hunters UK? Do you think it’s real of fake? Leave your interesting and creative responses in the comments section below. I often wonder this about all reality TV shows. I used to see actors on one show, only to see them on another show the next year as a “real” person. I can understand why people might think that the show is fake. They are also those that do not understand what goes into making of a show like this. Sorry to say but the auctioneer is a not a real auctioneer in the states or the here and auction don’t happen here and I was on the show as a background bidder and all the stuff you see is never actually won. Now I see them bringing over the U.S. bidders or a few and those few were found to be not real buyers. Actually, Sean Kelly is a licensed & bonded auctioneer in the state of California, a graduate of the World Champion College of Auctioneering and he is a member of the National Auctioneers Association and the National Self Storage Association. He is a real auctioneer and a real comedian, and these two skills were exactly what he needed to get cast on Storage Hunters. Hey whether fake or real you can’t help but enjoy their characters. The boom guy is just hilarious. My only real observation that’s annoying is how the “bin’s” are ready rigged with camera before they “cut the lock”! Now that requires that they open it up prior to the “cut the lock” and either the audience are in on it & have to fake their reactions or its done beforehand which makes the bin interfered with & the lock not original etc…. It’s all fake you sad people, who believes this $h!+ is real. the uk doesn’t allow unit sales, the owner of the unit would have to take the hirer to court to get a court order for rental payments or seizure of goods. Natalie is the vilest female I have ever had the misfortune to witness. Revolting creature. I’ve been trying to tell my brother for months it’s all fake but he just wants to believe what he watches.I knew there was no way it could be real and as I said all lockups were well staged. People in Britain don’t leave things of value in the lockups if they need cash. Just watched a UK episode where the woman ‘wins’ a De Lorean. Reminds me of a US episode where exactly the same thing happened. What are the chances of that? It is entertainment really I used to try and think it’s possible as you would not pay hire on a unit for stuff that’s worthless but on the other hand if you had a delorean that’s worth over £20k you would sell it lobg before you couldn’t pay the rent lol plus I can’t see how you would get ownership of any of the vehicles obtained this way in this country. Storage Hunters UK is as fake as a five bob note, as we say in Britain. I’ve watched a couple of episodes now and the bidders are cartoon-like in their stupidity, their bizarre behaviour and their ridiculous outfits. If it ever gets to America, please, folks, don’t think they are typical of British people. In one episode a working DeLorean car worth £25, 000 was discovered under a cover. Sure. Everyone in Britain has a DeLorean, leaves it in a storage unit to moulder away and then forgets its existence. Come on, guys, we’re not that dim. The theming of the contents of the units is also a dead giveaway. Today we had a Punch and Judy Man’s unit, and a unit packed with nothing but catering equipment. The auctioneer, Sean, is always suspiciously well-educated on the value of contents of units. There’s clearly a core of cast members among the bidders, with a gaggle of bemused real people tagging along as extras. But – fake it is, with knobs on. My father-in-law, now sadly deceased, had a theory that if someone dumped a ton of hot and steaming cattle droppings in the corner of your living room, you wouldn’t be able to take your eyes off it. The producers of this programme clearly subscribe to the same theory. Well, I enjoy watching episodes with Heavy D in them. Of all the male and most female buyers he shows his emotion, creativity and compassion for the “well mannered/social” female buyers. Combined with The Boom, his methaphores and outfits make him a pretty good role model in my personal opinion. I dont know if everybody is actor or not, but everbody can defenitely act. Thats clear to see in the ludic acted bits after every sale. But the acting is not proffessionally good. Except for Heavy D’s of course. Must be mostly fake – they found a light aeropalne in a barn at a storage yard that had “been there for years”. You only need to look-up it`s details on a public government web-site to see that it was fully certificated (paperwork like an MoT) and insured continuously since it was built and based with a flying school at an airfield a few miles away and no changes in ownership are recorded. I watch storage hunter but now Iv stopped watching bcos of heavy D. Why is he like that? Is he mentally ill? My kids are terrified after watching that. It’s not normal to act like that. My kids can’t watch telly tubbys now bcos they think its him. Get him off the show! !